On April 5, 1968, the day following Rev. 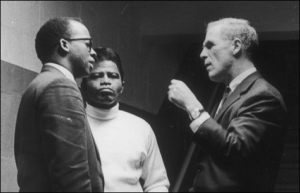 Dr. Martin Luther King, Jr.’s assassination in Memphis, Boston Mayor Kevin White (pictured above at left, Thomas Atkins, James Brown and White) had a big decision to make. Would a James Brown concert planned months in advance take place or be cancelled? King’s death sparked violence in cities across the country including in Washington, D.C. where President Lyndon B. Johnson declared a state of emergency. Boston saw sporadic rioting, much of which was limited to the predominantly black neighborhoods of Dorchester and Roxbury. White and Thomas Atkins, Boston’s first African American city councilor, decided that the show must go on if Boston was to remain violence free, “It’s too late to cancel it; the word won’t get around in time. There’ll be thousands of black teenagers down at the Garden this evening, and when they find those gates are locked they’re going to be pretty pissed off. King’s death and Brown’s cop-out will get all mixed up together and we’ll have an even bigger riot than last night’s—only this time it’ll be in the heart of downtown,” Atkins said. Atkins came up with a plan that would not only satisfy people who attended the show, but would also provide entertainment to those who could not or would not leave their homes because of the unrest. White convinced WGBH to televise the concert. But Brown, a savvy businessman, stood to lose $60,000 due to a non-compete agreement relating to a taped television show, not yet scheduled to air. After some arm twisting, White guaranteed Brown $15,000 and convinced Boston Garden to pitch in the rest. The concert was a hit and order was restored. On April 5, 2008, the 40th anniversary of the concert, filmmaker David Leaf (The U.S. vs. John Lennon), released the documentary The Night James Brown Saved Boston. The film contains footage and interviews that capture what took place before, during and after the event, “My goal is to tell stories about great artists that inspire, inform and are also relevant in contemporary times. The events of the documentary should have been told in film long before I made this, but it had been overlooked. So I made the film because what James Brown did that night in Boston was not only important and heroic but it was a story that few people outside of Boston knew about. It’s also a key moment in the James Brown story, and in the last decade of his life, Mr. Brown wasn’t often being acknowledged as a massively influential, vital and important force he was/is in the history of music,” Leaf said in a recent interview. The combination of a 1967 mayoral election that pitted pro- and anti-busing forces against each other and King’s murder ramped up the city’s simmering racial tension. White’s opponent, Boston School Committee member Louise Day Hicks, had refused to enforce the Racial Imbalance Act of 1965, which made segregation of public schools illegal in Massachusetts. Like White, Atkins supported busing which resulted in threats against he and his family. In The Night James Brown Saved Boston, Leaf reinforces the positive message Brown sent by coming to Boston at such a difficult time, “While making the film, I had to dwell in a creative space that the history of racism in Boston (and in America) is a deep and disturbing subject, but that this one moment felt like a brief ray of light in an otherwise horrifically dark time. There were key elements to what happened in Boston in April, 1968 and afterwards (inside and outside of government) that couldn’t be addressed in just this one documentary. Like all stories, it’s a lot more complicated than can be told in 75 minutes,” Leaf said. Young James Brown aka Tony Wilson (pictured above at left, Brown and Wilson) first met Brown when he was ten years old, “Our neighbor asked my mother if I could come to a concert at the Regal Theater in Chicago to see James Brown. I was able to see him. I even jumped on the stage,” said Wilson. After being crowned the Best Michael Jackson Entertainer on Oprah Winfrey’s syndicated talk show in 1982, Wilson’s career took off, “I started getting calls from everywhere,” Wilson said. Soon, Brown asked him to perform with him on stage and in movies, “My relationship [with Brown] grew in 1989 and we were really close. 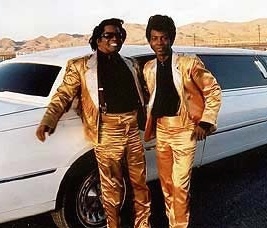 James Brown took me on tour with him. We started doing movies together. We did Funk Blast and Beat the Devil which was directed by Tony Scott,” Wilson said. Brown admired Wilson for displaying the same showmanship and charisma that had made him a star, “On the [movie] set, he called me to his trailer and [gave me a note that said], ‘To Tony Wilson, Number 2, keep on being me,’” he said. Wilson was devastated when Brown died of congestive heart failure on December 25, 2006. Close to midnight, Wilson received a call from Brown’s longtime manager, Charles Bobbitt, telling him that his idol had passed away, “Bobbitt said, ‘We lost him,’ and hung up. It hit me hard, it was unexpected,” Wilson said. Tony Wilson is carrying on Brown’s legacy in a big way with an upcoming tribute to The Hardest Working Man in Show Business. While performing with the Isley Brothers in Boston this past January, Wilson read a Boston Globe article about the 49th anniversary of the 1968 concert and felt that something needed to be done.